The American public’s interest in exotic Chinese food peaked in the early 1970’s when several events culminated in a “perfect storm” of Chinese food mania. First several prominent Chinese chefs arrived here from Taiwan. They were trained in China but exiled to Taiwan, along with their Nationalist patrons, when China fell to the Communists. These chefs opened restaurants in New York City serving unfamiliar cuisine from regions such as Sichuan and Hunan. Chef Peng opened Peng Yuan, Chef T.T. Wang was in charge of the kitchen at Hunam and Wen Dah Tai (Uncle Tai) presided over the kitchen at Uncle Tai’s Hunan Yuan. Then, in 1972 President Richard Nixon made his historic visit to China. Americans watched closely on television as President Nixon attended the state banquet at The Great Hall of the People in Beijing. The sumptuous scene was alluring in spite of the fact that the meal was, by comparison to an imperial banquet, rather proletarian. New Yorkers especially went out in droves seeking adventures in the city’s new Chinese restaurants. Sichuan cuisine, defined by a numbing and spicy hot (or “mala” 麻辣) sensation created from Sichuan peppercorns and chilies, became a particular favorite. Sichuan dishes such as Kung Pao Chicken and Twice Cooked Pork turned into standard menu items in many Chinese restaurants. One singularly important ingredient, chili oil, is the foundation of these Sichuan dishes. Chili oil can make or break a dish. Although commercially produced and available in Asian markets, homemade chili oil offers a far superior flavor and is a worthwhile endeavor for the serious Chinese cook. Although not essential, purple gromwell will give the oil its reddish hue. It is a plant species of genus Lithospermum and is sold in the form of shredded root in many Chinese herbal medicine shops. You can omit this item, which is unusual and can be hard to find, but the oil’s color will lack brilliance. Armed with this delicious and complex oil you can create authentic and sophisticated Sichuan dishes that will make your friends envious. 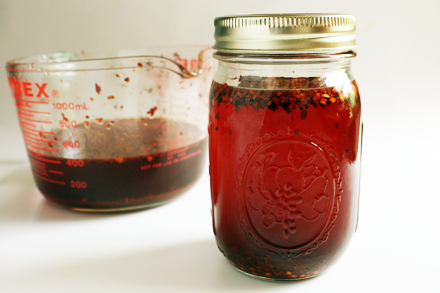 Once you’ve used homemade chili oil, I guarantee you will never go back to commercially produced one again. Soak the Sichuan peppercorns in the oil for at least eight hours or overnight. In a three-quart saucepan cook the oil and Sichuan peppercorns on low heat. Add the ginger root, scallion, cloves, cassia bark, star anise, black cardamom, dried whole red chilies and purple gromwell. Simmer the oil for about 20 minutes. Put the dried red chili flakes and powder in a three-quart mixing bowl. Strain the oil through a wire mesh strainer and pour it onto the chili flakes and powder. Discard all the other ingredients from infusing of the oil. Let the oil steep in the chili flakes and powder for two or three hours before using. Thank you for visiting Red Cook. This chili oil is amazingly flavorful. Most commercial chili oil is just infused with chili but not spices. Use this oil for any spicy Sichuan recipe. Enjoy! With fresh ginger and scallions, does this sauce run the risk of botulism? Botulism is always a risk in food preservation. In this case we remove all the spices and herbs, including fresh ginger and scallion, before pouring over dried chili and preserved. Botulism bacteria will not grow in low moisture environment. Since we remove the high moisture ingredients of ginger and scallion before storage, the risk of having the bacteria growing is quite low. Still we should always be conscious of storage condition. Refrigerate the oil and use the oil within six to nine months. Hi Kian! I’ve been a faithful reader of your blog for some time now, and I’ve learned so much about Chinese cooking (more than what my mom taught me)! I wanted to say congratulations on your James Beard nomination; you deserve it! Hi Joyce, Thank you so much for your kind words. It is wonderful to know that Red Cook is helpful in providing you with Chinese cooking information. Lovely post! I’ve been wondering what some of the spices I brought back from China were. Low and behold, the “grass fruit” is black cardamom. I also have these little white seed pods with black seeds inside that are sometimes found in mapo tofu. Any ideas as to what they are? Keep it up and congrats on the James Beard nomination. Hi KDA, Thanks for you kind words. The white seed pods you described sound like green cardamom, which often look white on the outside. Green cardamom pods are used in the cooking of Southwestern China including Sichuan and Yunnan cuisine. hi, I’ve just recently found this blog, Congrats on your deserved Beard nomination. I was tempted to make the NYTimes DIY Kitchen chili oil and then saw your post and decided this sounded so much more interesting. Very glad I did–it’s so full of flavor and just the right amount of heat (I did use a little less of the cayenne). Have been using it on all sorts of things for which it is probably not strictly intended, including popcorn…. My other motivation was that I recently went to Little Pepper in Queens and loved a dish that seemed very simple–what seemed to me to be just silken tofu in chili oil with a lot of blackened szechuan peppercorns and maybe crisped scallions. Needless to say, when I tried it at home, it wasn’t the same. Do you have any idea what I might have eaten, or what a recipe would be? I think it was not ma po tofu or not what I know as ma po tofu since I didn’t taste any beanpaste, but can’t find recipes when I look for “cold szechuan tofu” and unfortunately can’t remember the name of the dish we ordered. I am so pleased you like this chili oil recipe. 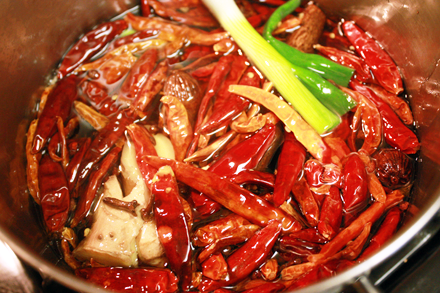 It is a great base for many spicy Sichuan dishes. The cold tofu dish you described is a wonderful appetizer served regularly in Sichuan. It is sometimes served as a preserved egg and tofu dish. The dressing is what we call “mala” dressing. It is made with soy sauce, black vinegar, sugar, Sichuan peppercorn powder, the chili oil and optionally a little extra Sichuan chili sauce. 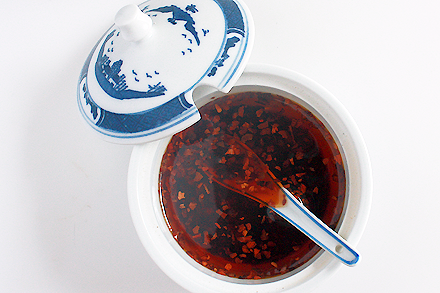 This chili sauce is made with fried onions, Sichuan peppercorn, fermented soy beans, sesame oil and other seasonings. You can buy this Sichuan chili sauce in Chinatown market and the best known brand is “Lao Gan Ma” or “Old God Mom.” Here is a facebook page on “Lao Gan Ma” brand of chile products. The one you should look for to make the dressing is currently depicted in the fifth picture in the photo album. I believe this is the sauce that Little Pepper use for their “mala” dressing. Enjoy! Thanks! Very useful information. Ok, off I go to get the ingredients for Mala dressing. I’m really enjoying your posts and hope to make it to NYC soon for a class (I live in Baltimore). Am very interested in having a stab at making this chili oil. What is the pronounciation and meaning of the chinese words for purple gromwell? I can see that the second word means grass. Would every Chinese herbalist know it or will I have to wait until I am in Hong Kong? Hi Callie, I’m so pleased you’re interested in making this chili oil. The first character in the Chinese name for purple gromwell is “purple” and is pronounced “zhi” in pingying. Combined the name means “purple grass.” You can find them in a Chinese herbal pharmacy if there is one in your city. Thanks. I will see if my local shop has it. Hi, I am looking forward to making this oil for my sichuan cooking. I was just wondering as it is not clear in the instructions: after pouring the strained oil over the chili flakes and powder and leaving it to steep, do you then pour the whole lot into a jar for future use, or do you just pour off the top and discarding the flakes and powder at the bottom? Hi Steffan, The answer is yes and yes. It is up to you to decide how to use the oil. You can use the clear oil for cold dishes that calls for a clean looking sauce. Or you can scoop up the chili solids at the bottom to make such stir-fry dish as Gong Bao Chicken. Personally I like to use the solids in just about all my recipes. EXCELLENT EXCELLENT POST. Thank you Mr. Kho for writing such an informative piece. I am literally hooked on that bean curd and celery salad dish. I will try it with this base. For a few brief years during my adolescence my parents lived and worked in Chongqing. When I visited during my breaks from school I had a hard time adjusting to the cuisine. I have no idea why, as I was born and raised in Xi’an and everyone in my family loves chilli. There’s even a little poem about the 8 bizarre habits of the Xi’anese, one of which is ‘using chilli as a vegetable’. Anyway, during those brief summers and Christmases I ate a lot of Sichuan food and I have to say, though I got used to the spiciness of absolutely all their dishes I never got used to the hour long numness induced by their peppercorns and as a result have never been a fan of Sichuan cuisine bar the occasional hotpot or bowl of noodles. I will admit though, even having not returned home in nearly 5 years, I make a conscious effort to keep well stocked on Xi’an ‘youpuo’ chilli as well as Sichuan pickled cabbage. I find just those 2 condiments and a little bit of rice is a meal in itself, albeit not a particularly nutritious one. Thanks for posting your recipes. It’s difficult to find authentic Chinese recipes as we appear to have mastered the art of ‘guessage’ with regards cooking. Not a single person in my family can tell me exactly how they make the delicious meals they do whenever I visit. I fear they secrets that will be taken to the grave. Thank you for your insightful comments. It is interesting how different people react differently when they first experience Sichuan peppercorn. For many it is the numbing sensation that is addictive. Sichuan food has become very popular in China as ell as all over the world. I think it is the strong and explosive flavored dishes that make Sichuan food popular. I am also a big believer in understanding proper cooking techniques if you want to be serious about cooking either at home or professionally. This is why I always emphasize them in my writing. I do hope these instructions will help Chinese immigrants overseas understand their culinary heritage and reproduce the flavors they are familiar. This spicy Sichaun oil is amazing! So much more complex and interesting than the store-bought varieties; it’s a new favorite of mine. I like to make it using high-quality peanut oil. Thank you very much for the recipe! Hey, thanks so much for putting up authentic, core recipes like this one. I view this kind of info as the buried treasure of the online culinary world. Anybody can look up a generic Kung Pao recipe online, but this elevates. I come away feeling I have gained significant insight and a new skill. Thanks, again! Dryed Sichuan peppercorns are not very numbing, so how mutch should I increase them 1 Cup ? The recipe is for dried Sichuan peppercorns. So you can go ahead and use the measurement of the recipe. However, I do encourage you to experiment. If you like a more numbing sensation then go ahead and add more Sichuan peppercorns. Make it your version of the chili oil. Thanks for sharing your recipe for this chili oil! I’m currently obsessed with authentic Sichuan cuisine, especially anything involving the Sichuan peppercorn. I toasted up some extra peppercorns, ground them and added them to the final steep for that extra numbing effect. I’m planning on making some cold Ma La tripe and tendon, tossed with this oil, celery, cilantro and ground peanuts. Oh man, I’m salivating. My favorite condiment in the world at the moment is the Lao Gan Ma brand Spicy Chili Crisp Sauce (老干妈香辣脆油辣椒). I can pretty much eat it out of the jar… I’m trying to replicate it, but there is little literature in English on the internet revolving around it’s creation. I see that you referenced it in a reply to someone, but I’m wondering if you have ever made something similar, or know their cooking process? I cook for a living and am passionate about food, so I’m prepared to move to Chengu for the answer if I have to! Lao Gan Ma brand Spicy Chili Crisp Sauce is most likely made from crisply fried garlic and shallot along with peanuts, salt and sugar. You can try mixing those ingredients with the my version of chili oil and adjust the flavors if needed. Good luck! Just found your site. Nice work – lots of great stuff on here and I’m definitely going to try some of your recipes! Like Ethan, I’m addicted to Lao Gan Ma brand Spicy Chili Crisp Sauce (or mala in general). But feel it’s a bit of a cheat. Did you ever have any luck with the recipe Ethan? 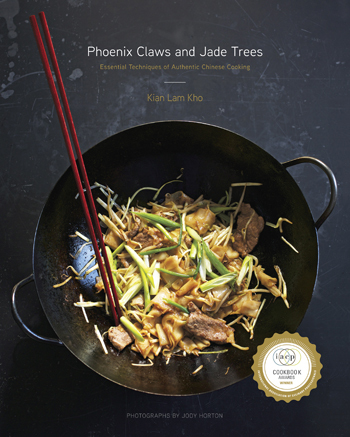 I used Kian’s recipe as a base for my analog of the Lao Gan Ma sauce. Towards the end of the recipe, I strained the oil into some toasted and ground Sichuan peppercorns, along with the chili flakes and powder. To create the sauce, I cut several shallots into a fine brunoise, along with diced dried chili peppers, and caramelized them deeply in peanut oil along with ground peanuts, a little sugar and salt. Towards the end, I added dehydrated fried garlic (found in Asian markets), and then incorporated this mixture into my chili oil. It’s not an exact replica, but this is perhaps a good thing, as I found Kian’s oil to be a very flavorful base for the sauce. Thanks so much for taking the time to share this. Much appreciated, and I can’t wait to give it a go! wow……finding your site has raised my spirits high, Kian. i lived in nanjing for 6 years until june last year, and became obsessed with the szechuan paste i could buy in jars at suguo super markets there. would that paste , which had an almost black colour to it in the jar, and was superlative for seasoning home-made stirfry dishes. could this be a derivative of your chilli oil ? i have long searched for the recipe for that paste. Thank you Lawrence for your kind words about Red Cook. I’m always gratified when my readers find my articles useful to them. I think you should try Ethan’s suggestions in the previous comment. It sounds very close to what you will find in the jar of Lau Gan Ma. I love that chili sauce as well. Since I have access to the sauce so readily in NYC I’ve never really tried to replicate it at home. Have fun exploring the Sichuan flavors! I’m very excited for this chili oil! Will be making it today. I had a question though, as I’m getting a bit confused by the different types of sauces referenced so far. This post describes making the Szechuan chili oil. However, you also responded to one comment about making a separate Ma La sauce (starting with this chili oil, but with soy sauce, black vinegar, sugar etc.). I plan to make a Ma La tang soon, as well as many other Ma La dishes, but not sure if I should start with the chili oil or if i should first use the chili oil to make a separate Ma La sauce as the base. Are the two different (this chili oil vs. the Ma La sauce)? My guess is that I want the Ma La sauce for specific recipes, and this Szechuan chili oil for general spicy dishes… but not entirely sure.. if you also have a recipe for rough proportions for making the Ma La sauce that would be great. Either way I am extremely excited to make this!! Thanks so much! I’m glad to hear you’re excited about this chili oil recipe. Yes, I love this chili oil and use it in many of my cooking. I make hot and spicy dressing using this chili oil for many of my salad and cold dishes. 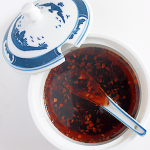 For making Ma La dishes, such as stir-fries and stews, you will need to not only use this chili oil but fortified the “ma” with ground Sichuan peppercorn and the “la” with additional dried chilies. You will also need to add soy sauce, black vinegar, sugar, cooking wine and some time Sichuan hot bean paste. To make Ma La Tang I suggest that you use the exact same ingredients I have listed above for infusing the oil then add chicken stock or vegetarian stock without straining the oil. Season the stock base with salt then you can add the dumplings, meats or vegetable ingredients. This chili oil by itself is not usually used as condiment. For condiment I would suggest adding salt and fried garlic to it. So follow some of the suggestions from previous comments to try to reproduce the Lao Gan Ma chili paste. If you add fresh moist ingredients such as garlic, ginger or scallion you will want to make sure you fried them till completely dried. This way you can store the chili sauce for a longer period of time. Otherwise any moisture can promote growth of bacteria and can be dangerous. Hi, love your site and recipes, it is very inspiring! I have made this oil twice, and both times it turned out amazing with such an rich depth of flavor. The thing that I am frustrated about is I have not been able to get that kind of numbing effect from the Sichuan peppercorns that I get from dishes at local restaurants. The last batch I made I upped the quantity of peppercorns from 1/4 to 1 cup and it still really made no difference (but the result was still delicious! – but mainly from the other spices) I have also had this problem with other recipes using peppercorns. Do you think it is a problem with the quality of the peppercorns I am getting (from Chinatown NYC) or is there something in the preparation (like dry frying first) that needs to be done? Thank you so much for your kind words about Red Cook. I’m so glad you’ve been enjoying this chili oil. Adding extra Sichuan peppercorns to the oil is not going make it numbing. Depending on what you’re making you can use Sichuan peppercorn powder. You can either buy the powder in a market or if you have a spice grinder you can make your own. To make your own powder toast the Sichuan peppercorns in a frying pan until you can smell the fragrance but not burned. Then just use a spice grinder to pulverize them into powder. Sichuan peppercorn powder can be used in cold dishes or in stir-fries. great, thank you so much! I will definitely try this soon. I’ve got the same problem here in Europe, the quality of dried sichuan peppercorns vary a lot from one brand to another. I usually put one whole tablespoon of them in my Dàndàn miàn. The fresh husk are incredibly numbing in comparison. I love these recipes. Can you be more specific about what kind of chilies you are using? There are so many available. Your recipe has dried whole red chilies,red chili flakes, and dried red chili powder. 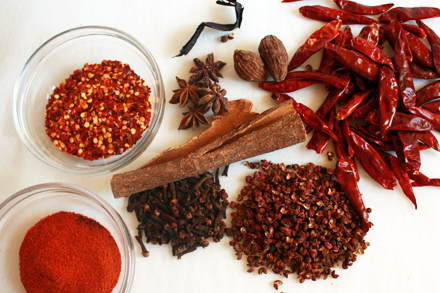 Is the red chili powder the same as cayenne pepper? Are the red chile flakes just the whole red chilies crushed? How much flexibility is there on these ingredients? I find that the options available vary wildly store to store. You should try to source the chilies from an Asian market if you can. As pictured in the second photograph of this post, on the left side there are two bowls of chilies. The top one is the flakes and the bottom one is the powder. The powder form of Asian chilies look very much like cayenne pepper but much hotter is spice level. So I would highly recommend that you search for Asian suppliers to provide you with these ingredients. Great guide, been looking for a good chili oil recipe on and off a while now. Looked up Mala Sauce on wiki, outlines it ell enough, but there semed so many ways of doing this on internet searches. Always end up coming back here though when I’m thinking of starting, so its high time I waded in and made my own – your recipe of course. Although I’ve no problem with making it to my own preferences, would it be fine to use Annato seeds for getting the oil red, as Ive already purchased these from Amazon for use in my curry recipes. As I understand it, the annato seeds impart little flavour in the oil, while it may not be noticeable in a curry – what about this recipe? Glad to hear you’re planning to try this recipe. I am not too familiar with the flavor of annatto seeds. I believe the seeds are use for creating yellow to orange color hue. So I would recommend that you do not use this seeds and make the chili oil without trying to “enhance” the color. There should be enough coloring from the chili powder. Good luck. I can get a good deep red from the annatto, just didn’t want flavour issues. Its used in Carribian/Mexican (Adobo) and many south american for that colouring, just wasnt sure if it would mess with the flavour of szechuan cooking.Clearly the flavours in those regions can mask annatto. Here’s a link if you want for reference. Finally found some reference to flavour – sweet and peppery, an how .. thanks for your time. The Chinese characters for purple gromwell is 紫草. You should be able to find them in Chinese herbal medicine store. They come in dried leaves and stems form. Enjoy the recipe. I’m going to try this recipe! I’ve had this oil in several cold dishes but have yet to find the “chunky” portion’s recipe. When I order sliced beef/tripe/tendon cold dishes, they come out with the oil and somewhat thicker sauce than what you have pictured. Is there a recipe or a term I can google for this? This chili oil recipe is meant for making the oil that’s used in other recipes. It is not to be used as condiment at the table. If you wish to make a chili-sauce-like condiment then you may want to add garlic, shallot, fermented soybeans, salt and a bit of sugar, but don’t add so much oil. You can also add peanuts and sesame seeds to make it even more fragrant. You should probably google “chili sauce” of you want a more complete recipe. Hi sir, i could not attain the numbness from the oil. Could you advise me? This chili oil is meant to be used as the flavoring oil for other recipes. So depending on your recipe you will need to add ground Sichuan peppercorn to add the numbing taste. To make ground Sichuan peppercorn you should first toast a handful in a dry frying pan or a wok. Toast it until you can smell the fragrance from the peppercorns. Then grind them in a spice grinder or coffee grinder. For numbness, look for prickly oil in your supermarket. Sounds great – I’ll be giving it a try with the Sichuan Wantons. I was just wondering if there is an average amount of time the oil should / could last for in the cupboard? Thanks for sharing your version of this fantastic oil. Such a “simple” concoction, yet one could surely write a whole dissertation about it. Wonderful! Thank you for your comments. I’m glad you find this post helpful. Personally I do not have any insight into infusing chilies at different oil temperature. But given that when the oil reaches smoking point it starts to become rancid, I would not recommend heating the oil to that level. In my recipe I suggest infusing the spices at simmering temperature so it will not smoke. Can you substitute the dried whole red chilies with fresh chilies?